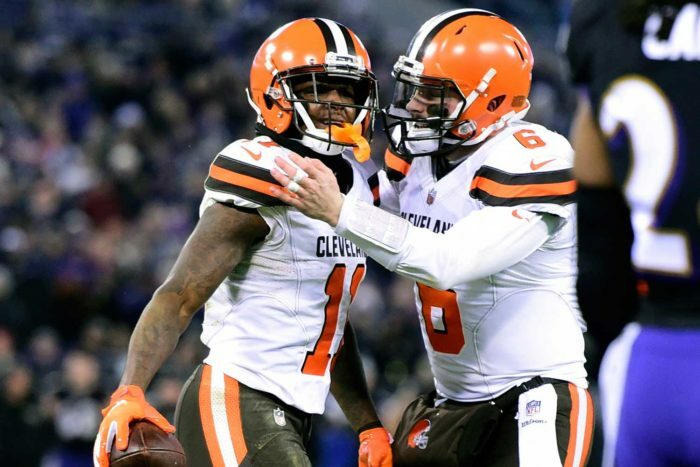 • The Cleveland Browns clearly will be a contending team in 2019, and one of their best players is wide receiver Antonio Callaway. He is one of the most natural receivers in the league, and he also is a dangerous kick returner. If mid-season pickup Breshad Perriman continues to improve, then the trio of Callaway, Perriman and Jarvis Landry will form a terrific receiving group for quarterbacks Baker Mayfield. Add in tight end David Njoku, and the Browns are going to put up points. • Congratulations to the Philadelphia Eagles for clinching a playoff spot. While Carson Wentz remains their future and franchise quarterback, backup quarterback Nick Foles brings a different and more calming influence to the Eagles offense. One thing he possibly does better than Wentz is playing within himself. Wentz, of course, is a marvelous athlete, and he has a strong belief that he can exert his physical will on every game. While this is admirable, this trait often leads him to play out of control and in a frenzy at times. Foles, on the other hand, takes what the defense gives him and understand precisely what he can or cannot do. As a result, the Eagles have looked more efficient on offense with Foles in recent weeks. • The Arizona Cardinals played one of their better games of the season but, ironically, it also may have been the last game for head coach Steve Wilks. If that is the case, one issue Cardinals management will have to contend with will be another potential rebuilding of the defensive philosophy. When Wilks came into the job, he started transforming the Cardinals’ defensive personnel and that could be an issue that will hinder progress in 2019. • It has been fashionable lately to criticize Minnesota Vikings quarterback Kirk Cousins for the team’s failures. We see it somewhat differently, however. One of the big personnel failures for the Vikings in recent years has been the neglect of their offensive line. This unit will have to be a priority in the offseason. The Indianapolis Colts have shown what a rebuilt offensive line can do, and that is a model for the Vikings to emulate. • We remain steadfast in our belief that San Francisco 49ers head coach Kyle Shanahan is one of the best young head coaches in the game. However, he desperately needs a strong turn of luck in the injury department. In Sunday’s loss to the Rams, the 49ers lost yet another running back when promising undrafted rookie Jeff Wilson was carted off; starting guard Laken Tomlinson also was carted off with what appeared to be a serious leg injury. We see the 49ers as one of the surprise teams for 2019 and a contender for the division… if they can stay healthy. • The Los Angeles Chargers offense needs to get untracked in a hurry. Once again, they played an uninspiring game on Sunday, letting Denver hang around for far too long. We feel that recent injuries to running backs Melvin Gordon and Austin Ekeler have brought the offense to a halt. As good as quarterback Philip Rivers is, we feel the Chargers need to have a robust running game if they are going to advance in the playoffs.